I wish all a Happy New Year! 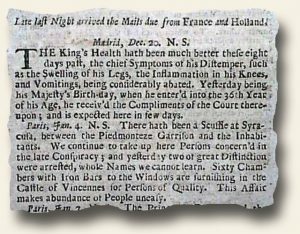 Finding reports in centuries-old newspapers which read like they came from today’s papers are always fascinating. They provide interesting evidence that life today, in many ways, is not necessarily so much different from years ago. 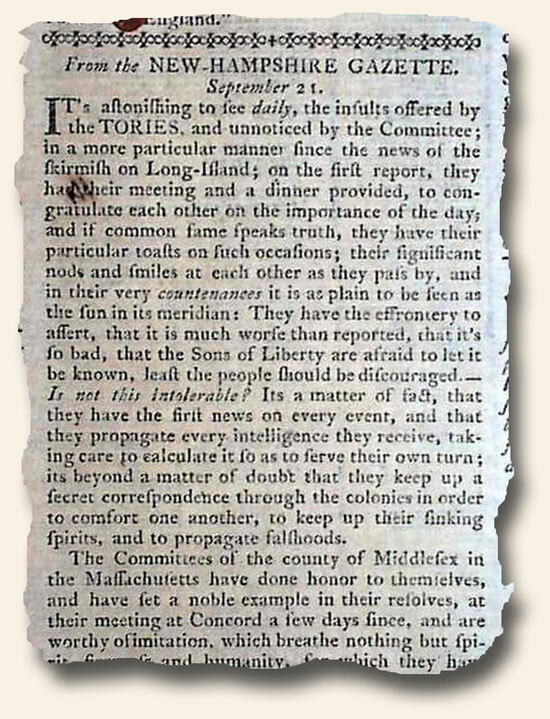 A report in the October 12, 1776 issue of “The Pennsylvania Ledger” newspaper (see below) of Philadelphia contains a very interesting piece which accuses the manipulation of news, reading: “It is astonishing to see daily the insults offered by the Tories…since the news of the skirmish on Long Island; on the first report…congratulate each other…They have the effrontery to assert that it is much worse than reported, that it’s so bad that the Sons of Liberty are afraid to let it be known least the people should be discouraged. 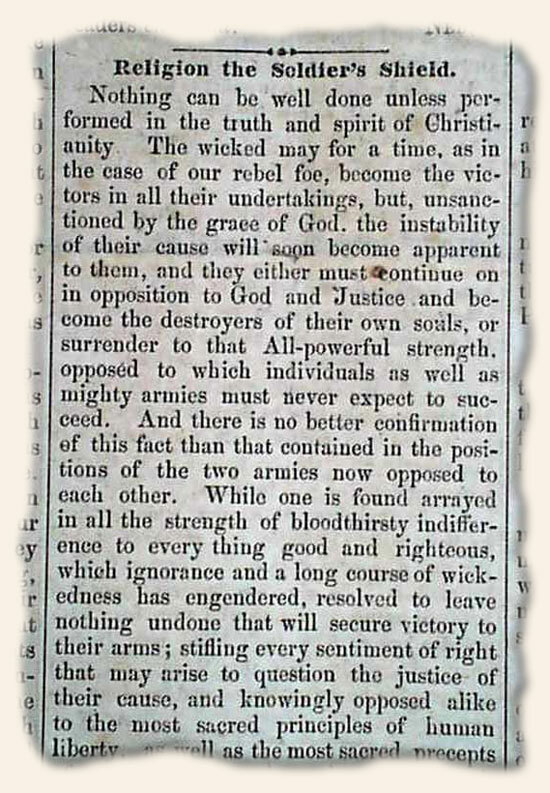 Is not this intolerable?…they propagate every intelligence they receive, taking care to calculate it so as to serve their own turn; its beyond a matter of doubt that they keep up a secret correspondence through the colonies in order to comfort one another to keep up their sinking spirits and to propagate falsehoods…” (see). In light of on-going accusations by political parties today that news reports are manipulated to serve their own interests, it is fascinating to find the same happened during the Revolutionary War so many years ago. 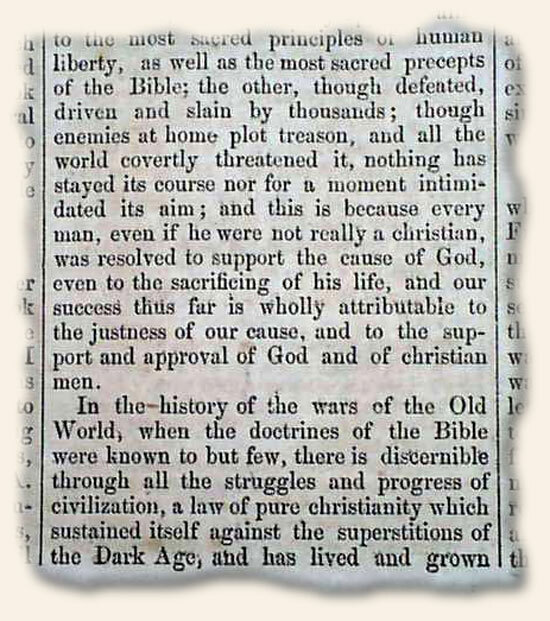 While Christmas is certainly a time when many who would not normally do so reflect on the spiritual, historic newspapers reveal a time when the lines between the spiritual and the physical were not nearly so distinct. Religion, while largely stripped from the currently public square, was part and parcel of daily conversation in the not to distant past. 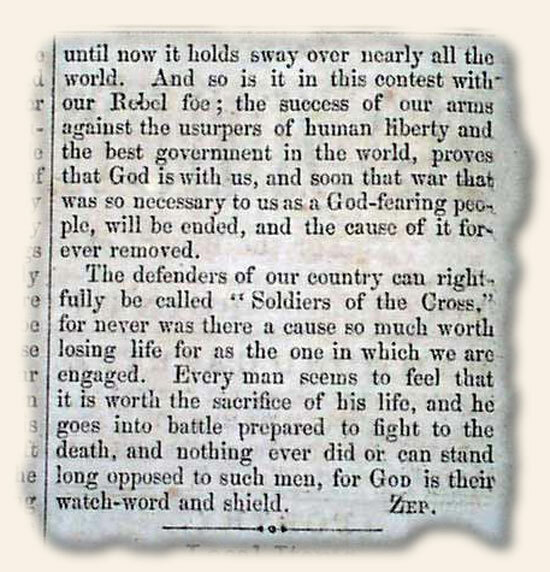 An example would be the following report of the importance of religion in the lives of Civil War soldiers found in the Hammond Gazette (Point Lookout, MD) of September 22, 1863. My Christmas wish is that we would regain our previous understanding of the role of true religion in everyday life, minus the driving harsh conditions of the past. Please enjoy. 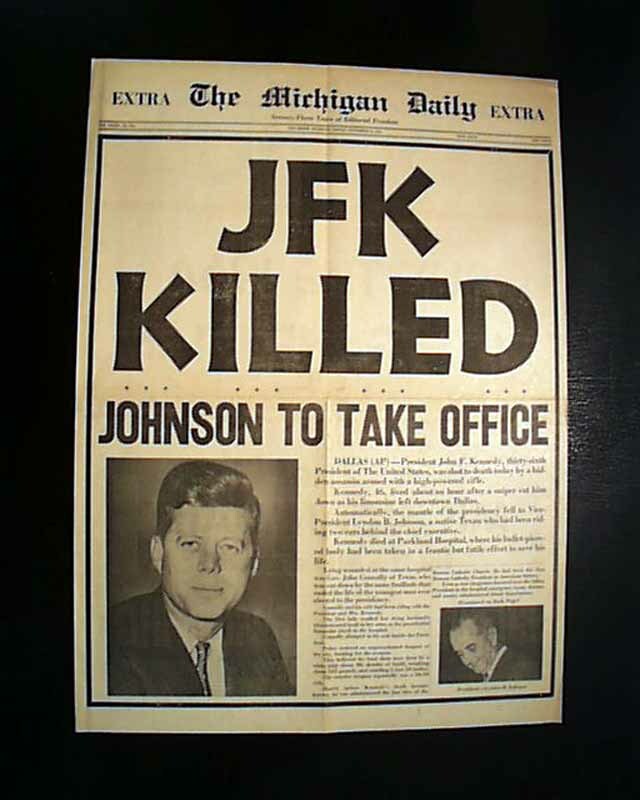 Always in the search for the most dramatic front page on the John F. Kennedy assassination, this issue of: “The Michigan Daily–Extra” of Ann Arbor, Nov. 22, 1963 (see below) just might “take the cake”. Have you seen a better front page? Feel free to share. Although newspapers reporting JFK’s assassination were saved by many, one issue which would have no reason to be saved, yet offers some interesting content relating to the assassination, is the “Dallas Morning News” of November 22, 1963. Although it was the day he was assassinated, being a morning newspaper it obviously has no mention of the horrible event, but rather is focused on Kennedy’s visit to the city. 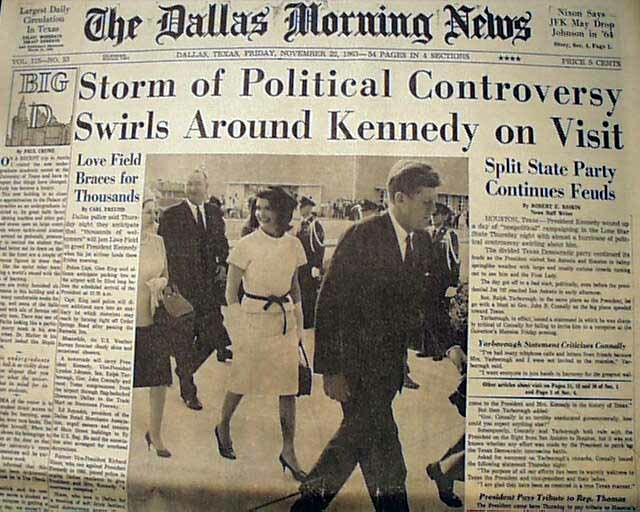 The headline reads: “Storm of Political Controversy Swirls Around Kennedy on Visit“. At the bottom of the front page is a map of the: “Presidential Motorcade Route”. It also includes the controversial full page notice by the: “The American Fact-Finding Committee” which is very critical of President Kennedy (see photos). This has become a rather well-know–and much desired–report in a period newspaper. 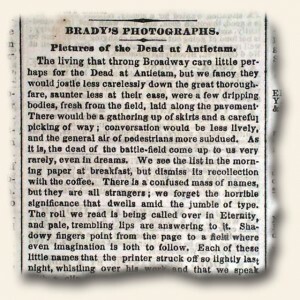 Also of curious interest–and only to be found in a Dallas newspaper–are two inconspicuous advertisements to be found on facing pages inside. One is for the ‘Texas” movie theater where Lee Harvey Oswald was arrested (trivia: he was watching the movie “War Is Hell”: see photo) and the facing page has an advertisement for the “Carousel”, the night club owned & operated by Jack Ruby (see). Because this issue had no reason to be saved, it is very rare today despite offering some great content relating to John F. Kennedy. Pictures… Is a thousand words always enough?